As the new 7th pay commission will benefit more than 47 lakh in service central govt. employees all across the country. In addition to this, more than 53 lakh retired govt. employees will have their pensions revived under the new recommendations. In addition to hike in the salary structures, structures of several allowances will also be modified, including the hardship allowance. The govt. provides extra allowance known as hardship allowance to all the employees who perform duty in high risk conditions and hazardous situations. This extra allowance is provided to the employees who push their physical and mental limit to perform dangerous operations and serve the country. Under the newly proposed risk and hardship matrix, some changes are brought which will be implemented from 1st July, 2017. On the basis of pay bands of the govt. employees, the hardship allowance is calculated. The rate of hardship allowance is calculated with the help of one hardship matrix. This provides a chart of the different rates of risk and hardship calculations which will be implemented such as low or medium or high, depending on the nature of job. 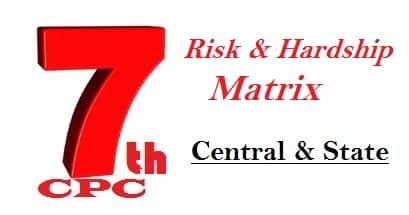 The newly proposed risk and hardship matrix has two fields – Risk and Hardship, having parameters low, medium and high. The matrix is divided into nine cells with one extra cell in the top of the matrix which will be specific to Siachen Allowance only, which is provided to those defense personnel performing tuff duty at the Siachen Glacier. RH-MAX will only be provided to those defense personnel deputed at Siachen Glacier. Jawans and JCOs (Below level 8) will get Rs. 21,000 per month as risk and hardship allowance. Where as senior officers above Level 9 will get Rs. 31,500 per month as Siachen Allowance. This allowance was limited to Rs. 14,000 before 7th CPC which was very low compared to the risks involved in the service. The rates of the risk and hardship allowances will get incremented after the Dearness allowance gets more than 50 %. Most of the hardship allowances has the fitment factor of 1.5 by this the allowance is calculated.